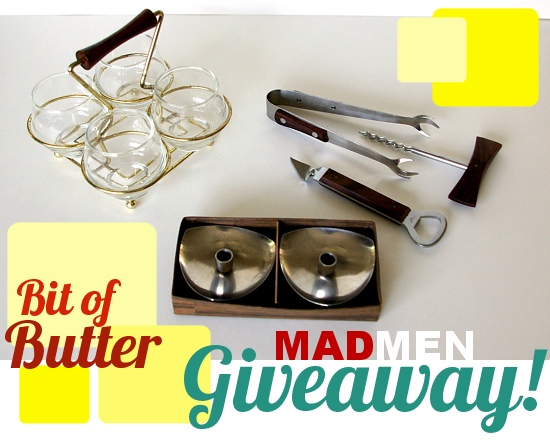 Mad Men Giveaway + Interview with Mod Shop "Bit of Butter"
I had to grill Alison on how she transformed Bit of Butter from a hobby into a beautifully curated and successful Etsy Shop. Hi Alison! Please tell the us a little bit about yourself. Bit of Butter is the brainchild of Kevin and Alison, a couple of PhDs who had a little extra time on their hands! Kevin is a computer scientist and Alison is a medievalist, so we love collecting. More than anything, we love finding out the stories behind the items in our home and shop. When did you start collecting mid century modern artifacts? We moved to Seattle three years ago when Kevin finished grad. school and our IKEA furniture fell apart during our trip north. We knew we liked clean, modern lines but we also loved the warmth of woods like teak and walnut. Soon, we had purchased our first Danish-Modern lounge chair and the rest is history! We got to know our new city by exploring thrift stores, estate sales, and picking up Craigslist finds. Once we furnished our own home, we realized that other people loved the same types of things we did, which is when our Etsy store was born! What is vintage hunting like in Seattle? We love vintage-hunting in Seattle. Since we are particularly fond of Scandinavian Modern, Seattle is the perfect place for us to explore! What story are you trying to tell with your shop, Bit of Butter? More than anything, our store features items we love! We won't sell anything that we wouldn't use in our own home (and oftentimes we display items that are for sale in the shop on our bookshelves until they sell). We feature clean, modern items with a whimsical twist. We try and research each item before putting it in our shop so that we can find out each item's back-story. I love the name "Bit of Butter" too, why choose that name for your shop? Well, originally Bit of Butter started as a blog that featured vintage recipes and kitchenware so we named it after the tongue-twister (http://en.wikipedia.org/wiki/Betty_Botter). As our interests have morphed more towards mid-century items in general, the blog and shop have changed as well. 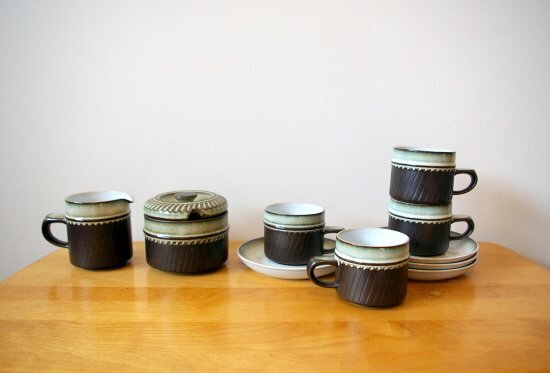 We still cook most of our meals using our vintage Copco collection and mid-century dishware, but now our blog is dedicated to our thrifting adventures! We also like to think that a piece of vintage is like the "bit of butter" on top of your favorite food -- vintage gives your home so much flavor and depth of character that you can't get when buying out of catalogues. I am stunned by the amazing selection of mod treasures in your Etsy shop. Can you share your top 3 hunting/thrifting tips with us? 1. Thrift Often: We hit thrift-stores once or twice during the week and usually once on the weekend as well. 2. Don't Feel Bad About Missed Opportunities: We've all had that moment when we're the second person in line for the estate-sale or Craigslist find. Let it go! There will always be another chair, book, record, or plate. 3. Be Open to Adventures: We will drive 200 miles for a chair or an estate sale because we love each others' company and we love exploring different areas. Don't be afraid to just start driving! What are sales trends you noticed in your reselling career; what sells well for you? We sell a lot of Scandinavian Modern, which is good, because we love to find it! We've also noticed that 1970s stoneware, especially modernist animal figurines sell well for us! 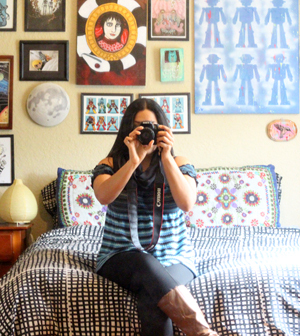 The photos in your Etsy Shop are gorgeous, any photography tips you can share? We have an older digital SLR camera that works like a charm to take great photos. We also use Picasa for cropping and color correction. Usually we stage our photos on white poster-board or in our lightbox. The biggest lesson we learned? Always turn off your overhead lights when taking photos because otherwise everything has a yellow glow, which can make items looks sickly and off-color. You've done very well on Etsy. What are your top 3 tips for making sales? 1. Only list things you like. I see so many stores that have a hodge-podge of treasures but no real theme to their shop. That's just not how we operate. If we think something is hideous (and not in that kitschy this-is-almost-cute sort-of way) we won't buy it, even if it might be worth some dough. Our shop is an extension of our love for Scandinavian Modern and mid-century design. 2. Research, research, research. Nothing annoys me more than seeing people sell enamel pans that are clearly marked Copco on the bottom without mentioning the company or the designer. If there's a designer to research, you can bet we've looked for her or him. Not only is it better for your buyers, but researching an item can often yield more money for the seller as well! Hard question time: what are your top 3 favorite thrift finds? That is such a mean question! Okay...here's goes nothin'. 1. Our Russell Woodard Sculptura Chairs: We were on our way to a nearby island for an adventure and stopped by a local bakery for some coffee. As we walked past an apartment complex we both noticed a pair of rusty old chairs next to a dumpster and immediately started walking towards them. We had them powder-coated and the rest is history! They are our favorite chairs! 2. Our Kay Bojesen Elephant: I (Alison) stopped by a recent thrift store for a quick once-over and stumbled across a beautiful wooden elephant. I just remember thinking to myself "there is no way this is Bojesen..." and jumping up-and-down when I turned it over and saw the mark! Kevin and I had just been talking about the items we'd love to find one day...this elephant being one of them! 3. Danish Modern Estate Sale: Kevin went to an estate sale for the couple who owned a local Scandinavian import company in the 1970s. Every brand you ever wanted was there...we are STILL listing items from that sale in our shop! It was the best sale ever! What are some final bits of wisdom you can share with those of us who want to make reselling vintage a full-time gig? Neither of us could do this without each other. Our vintage business has strengthened our relationship and our relationship has strengthened our business. This shop is a labor of love, but it's also an example of what two people can do, even when they have full-time jobs and social lives! It takes tons of support from one's family and friends for this gig to work! That and a whole lotta love for what we collect! 1.) Shop Bit of Butter and select your favorite item. Good Luck! 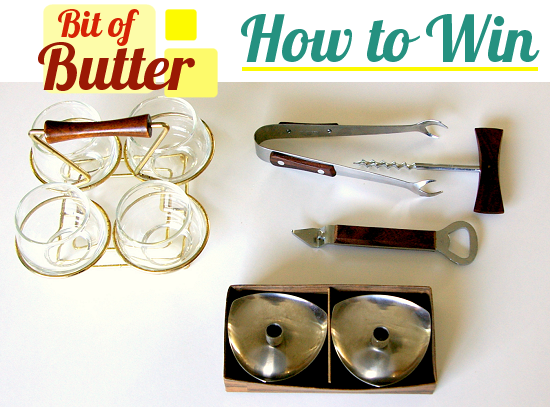 You have until August 16, 2011 to enter for a chance to win vintage swag from Bit of Butter. Oh, my goodness! Gorgeous things...but I especially love the Viking Glass Owl Tray. As if I need another owl. Ha! Following Bit of Butter through GFC...thrift posts...yay!! I just love the Takahashi Cat Planter! I love the penguin canister! I follow A Bit of Butter though GFC! I'm already a follower of thrift core through GFC! What a great interview. Lots of good tips in there too. I love that they love doing the business together. 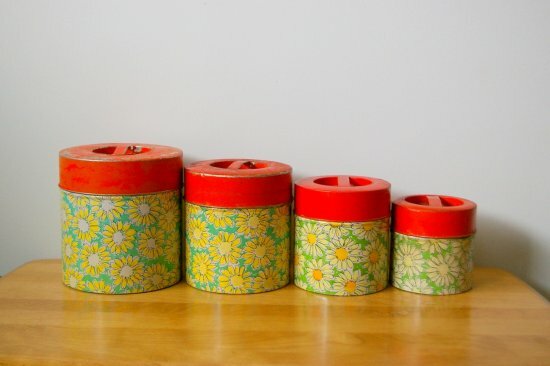 My favorite item is the Chippy Flower Power Canister set. Cute and a great deal! I love Allison's shop! I love the adjustable Tensor desk lamp. What a cool shop! My favorite thing is mid-century appetizer fork set. And I am following the Bit of Butter blog. I have Liked Bit of Butter on FB. And I always follow Thrift Core! Hard to choose a favorite - but I've got to go with the green Descoware, the color is amazing! Following the Bit Of Butter blog! I already follow Bit of Butter on Facebook! And I already follow Bit of Butter's blog. I am LOVING the silver roly poly tumblers. LOVE. ING. Following Bit of Butter via RSS. You guys -- you all have made our day! We can't wait to see who the winner is! And because we're so happy that everyone found our shop, we're offering a 10% coupon if you want to purchase something. Just enter the code: THRIFTCORE when you check out! Bit of butter is a great name - I love it! Firstly, after much consideration I like the silver roly poly tumblers best. Liked Bit of Butter on Facebook by my Faith Hope and Charity shopping page. My favorite item is the Blue Mountain Pottery Ceramic Pitcher. Follow Bit of Butter's blog and Facebook. The Bjorn Wiinblad for Rosenthal Aladin Plates. 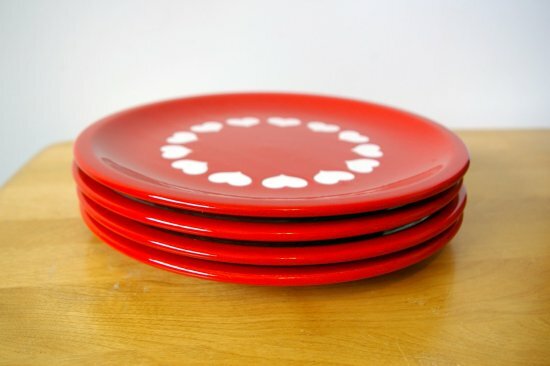 i love the Stavangerflint of Norway Oslo Viking Hotel Plate Designed by Kari Nyquist! I loved the penguin canister, very different and fun! My favorite is the Digsmed of Denmark Footed Cheese Board Made of End Grain Teak. I follow Bit of Butter through Twitter. I like the footed cheese board! I like the Dansk Kobenstyle Dutch Oven in Cherry Red - Made in Denmark - Designed by Jens Quistgaard! I like Digsmed of Denmark Footed Cheese Board Made of End Grain Teak! The salt and pepper shaker are my favorites...I like unique pairs and yours are the best! My favorite item is the Three Teak Salad Bowls by Galatix of England. I like the Teak Table Danish Modern. Very cool! 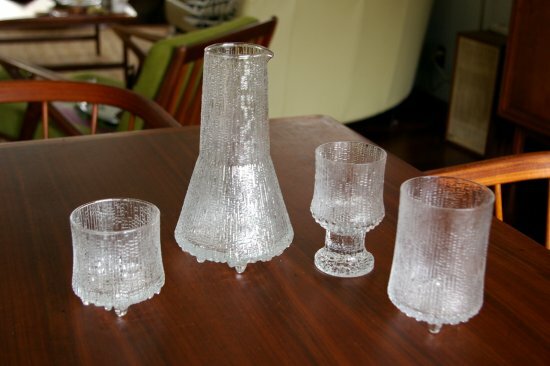 I think my favorite items are the Dorothy Thorpe Era Silver Wine Glasses! They are so stunning and unique! I'm following Bit of Butter's blog with Google Reader! I like Bit of Butter's Facebook page (Dara Nix)! I love that round teak table! 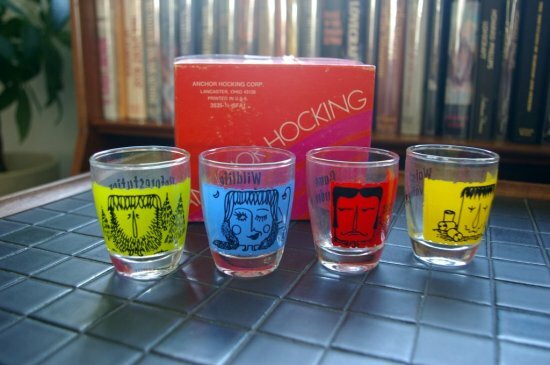 i love the madmen bar ware, still my favorite thing! 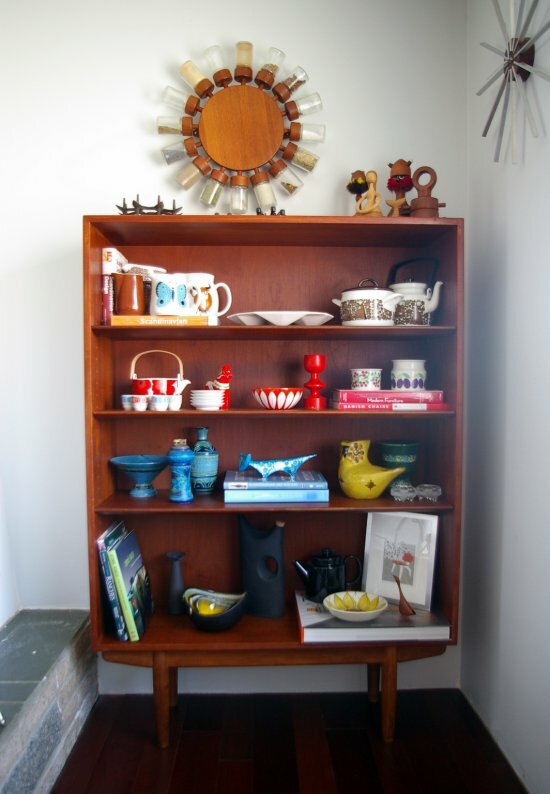 My favorite item is the West German Blue and White Enamelware Fondue Pot, Stand, and Forks!!! Following Bitobutter on Twitter by the name, Foxblaze. Liked Bit of Butter on Facebook! Following Thrift Core on Twitter! Following Thrift Core on Facebook! I really like the Blenko Water Carafe in Tangerine. 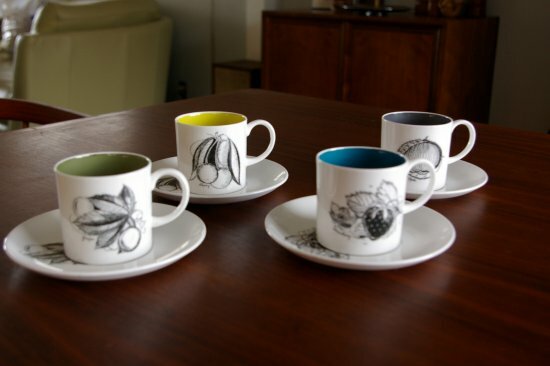 i like the Roly Poly Tumblers by Dorothy Thorpe in Silver looks retro like what i want to set my bar up as. I like the Digsmed of Denmark Footed Cheese Board Made of End Grain Teak. Really like the Footed Cheese Board. I love the Dansk Kobenstyle Dutch Oven in Cherry Red. Vintage Boat Cup is pretty rad.